Mama's Cup: Sun & Fun Basket Giveaway! It's here Mamas! The very first giveaway at Mama's Cup! The fantastic people at Kiss My Face have put together a special Sun & Fun basket of "obsessively natural" products for one very lucky Mama. 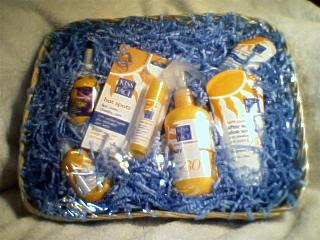 The basket includes Sunspray Lotion, Face Factor, Hot Spots, Swy Flotter and After Sun Aloe. It's really a lovely basket full of natural, preservative and paraben-free products that your whole family can use. So, go to it! Post a comment here--maybe something about your best summer memory or favorite summer activity--and we'll print out the comments at the end of the day. Then we'll fold them up, place them in a bowl and select the winner at random. You have until 9:00 PM Eastern Time to post your comments. We'll draw the winner shortly thereafter and make the announcement tomorrow! Ooh, pick me, pick me! Looks like some great stuff. My grandpa would take my sister and I on an all day fishing excursion every summer. We'd not catch many fish, but we'd spend most of the trip downing colas and candy. My favorite summer memories are going out on the pontoon boat with my grandparents and having picnics on islands in the lake. Thank you for the giveaway! When I was a kid, we lived in the country. I'll always remember going out into our front yard at night, setting out blankets on the ground, and lying down to watch one of the earliest sattelites speeding across the sky. The local newsies would broadcast the times it would pass over. Life is so rich. It's good to be a geezer. You can see how the tapestry plays out. My favorite summer memory is when I was growing up my Grandpa would visit us for the summer months. Every day he would walk me to the club house pool and let me swim for hours while he just watched. The walk was over a mile and he was in his 70's. His dedication and love for me still touches me deeply to this day. Being able to spend time with my grandparents was always a wonderful summertime activity. We only got to spend time with them over summer months and now that they are both gone, I sure do miss the good times we all had. Baking with grandma or going fishing with grandpa. You really can't replace that. We would visit the Kenya coast every summer and I have a myriad of good memories. One highlight would be stomping on crab holes and filling them up with sand only to watch the crabs dig the hole back out again. We would dance around singing some made up jingle of "filling up the crab holes" while we did it. Disturbing. I know ... but fun! One of my favorite summer memories is when my Grandparents would take my brother and I to Sea World when we were little. It was so exciting, as my parents never took us places like that! One of my favourite summer activities is swimming in the river. Even when the rest of the group is canoeing, I usually swim along beside. Swimming in the Blue Hole! I was afraid of going because my mom said that there were leeches there in the 70s but I haven't encountered any in the past few years.